Themed dinners have always been a fun idea but it is rare to find a restaurant that pulls off such an effort to create a thematic dining experience, not to mention the cost and the effort it requires to make an ambiance truly in sync with a theme. Most often, we only get to experience this during parties but never randomly. The Nostalgia Nights came to break the typical dining soiree by bringing in music and the overall experience of being part of a movie. One lovely evening, I got the chance to spend time with my mom over a four course dinner while stepping in a Mamma Mia theme. My mom and I loved this movie and this is the very reason that I have been fascinated with Santorini. The theme was very much relatable and that was what I absolutely liked about these Nostalgia Nights. The staff looked the part, dressed in jumper jeans and the place was filled with flowers, produces, splashes of blue and everything that would make Mamma Mia come to life. A band also took a major part in serenading us and spoiling us to a wonderful music to make it more festive. But the highlight would definitely be the food. It is a dining experience after all and that experience is something worth to remember. Just by looking at the menu, you could tell how carefully planned the dishes were so they go along on your the theme and I am instantly excited to devour on a delectable recipes while dressed up to blend into the theme as well. To start with, a booze is always a good idea. A rum infused Pinacolada sets the mood just right and a basket of freshly baked pastries should be just right to tame my growing appetite. A lentil and sausage soup was an interesting way to begin the dining course with the savory appeal of the sausage blending well to the starchy lentils. The Chiquitita Ceviche came in next, this is their version of a local favorite "Kilawin" or marinated raw fish in lime juice and oil, vinegar, pepper and ginger. The setting of Mamma Mia was right next to the Southern Aegean Sea so seafood should be considered a staple. For the main course, we had a generous serving of Grilled Anarki or Lamb served with mint gremolata, tomato confit and mixed greens. I like my protein cooked well done and it was absolutely spot on. But what blew me away is the Salmon Kalokairi with lumps of crab meat, mayonnaise and vegetables, the outer crunch and the tenderness of the salmon inside were perfection. It was light but didn't fall short in flavor and the textures were so diverse. And what better way to end a feast but with a plate of hazelnut cheesecake! Whether there's a special occasion to celebrate, a date you would love to spend or just a random urge to enjoy great food, the Nostalgia Nights will never let you down. 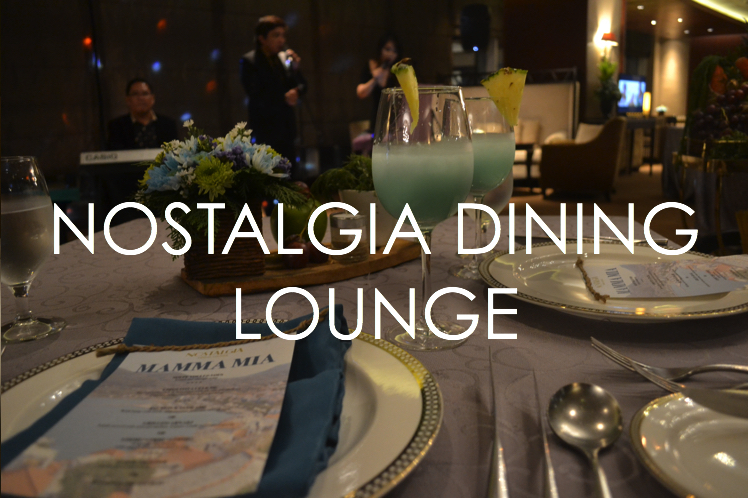 Nostalgia Nights indeed brought the dining experience to a whole new level. Spend one night at the Nostalgia Dining Lounge and you will see yourself coming back for more.